James Levine leads a remarkable cast in one of Verdi’s most enduringly popular operas and brings fresh insights to this beloved score. 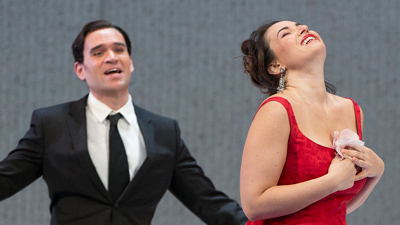 Ileana Cotrubas is poignant and touching as Violetta, the consumptive courtesan who finds true love with Alfredo, sung with style and passion by the great Plácido Domingo. Cornell MacNeil is Germont, Alfredo’s father, who forces the two apart, setting in motion events that lead to a shattering and tragic conclusion. Colin Graham’s production features design by Tanya Moiseiwitsch and choreography by Zachary Solov.